From September 26 to 29, JICA-RI Distinguished Fellow and former ASEAN Secretary-General Surin Pitsuwan visited Egypt. During his visit, Surin observed the assistance provided by JICA in the fields of higher education and preservation of cultural heritages, as well as the outcome of that assistance. In the course of his visit, he delivered a powerful message, saying "I want Egypt to take the leading role in the Middle East and Africa regions in education and other fields." Surin considers that education plays an important role in the stability and development of Islamic society. On this trip, Surin visited the Egypt-Japan University of Science and Technology (E-JUST) in Alexandria, as well as the Conservation Center of the Grand Egyptian Museum in Cairo. JICA has provided assistance for the founding of the university with the aim of developing high-skilled human resources. In addition, JICA has provided technical assistance for the preservation and restoration of cultural assets at the Museum in Cairo. Surin also visited the Alexandria National Museum and other sites. 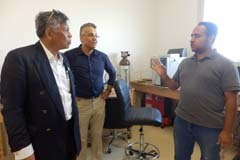 The tour gave Surin high expectations that E-JUST would become a hub of scientific and technological research and education in Africa and the Middle East, and that Alexandria would become a hub of academics and industrial development. He encouraged the people on the site, saying that unceasing efforts should be made in the ‘Spirit of Alexandria'. He also emphasized the importance of the quality of growth, saying that achievement of material prosperity alone does not constitute true scientific and technological development and true development brings spiritual and psychological abundance. Surin met with National Security Advisor and E-JUST Chairperson of the Board of Trustees Fayza Mohamed Aboulnaga and others to exchange views on the future direction of educational reform in Egypt. Aboulnaga showed a strong interest in incorporating the high-quality, highly productive work, ethics and discipline that supported Japan's high economic growth into education in Egypt. At the same time, Aboulnaga also touched on the difficulty in convincing the value of investment in education as a national priority when educational outcome is not visible at a time. In response, Surin pointed out that the strong leadership of the president and other leaders is a must to reform education. He suggested an approach to deploy a model school to demonstrate a way forward in educational reform. A package to encourage teachers, parents, guardians and other related parties involved to improve teaching methods, curriculum, and school management would be good idea, he added. Throughout his visit to Egypt, Surin repeatedly touched on the contribution of the Japanese people's rationality and discipline to socioeconomic development, from which other countries can possibly learn. Further, Surin cited Egypt's potential as a treasure house of historical cultural assets and tourism resources. He then showed his expectations for Egypt to play a leading role in Africa and the Middle East in the fields of higher education and protection of cultural heritages. Surin also visited Al-Azhar Mosque and stressed the importance of long-standing cooperative ties between JICA and Egypt. His visits have received media attention in Muslim countries.